From the Habanos Casa del Habano series. The flavor of Hoyo de Monterrey's blend makes it a perfect smoke for those aficionados who seek a delicate yet aromatic cigar that is lighter to taste but with great elegance and complexity. The factory name for this special production is Mágicos (ring gauge 52 x 115 mm in length). Each box of this special production contains 10 Epicure de Luxe in a Slide Lid box. Each box of this special production contains 10 Epicure de Luxe in a Slide Lid box. The flavor of Hoyo de Monterrey's blend makes it a perfect smoke for those aficionados who seek a delicate yet aromatic cigar that is lighter to taste but with great elegance and complexity. 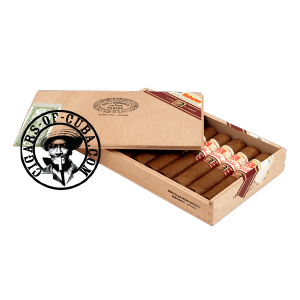 Enjoy the cigars whilst you smoke them, as they are limited in quantity. Every time you smoke one, there is one less in the world. The favor is excellent. Light taste, recommended for those who like light cigar with great aroma.